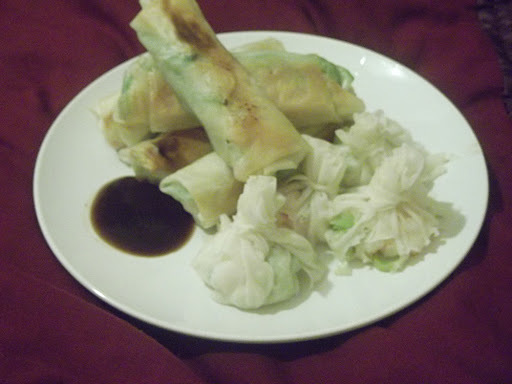 Spring Rolls and Prawn Won Tons – Perfect for Chinese New Year! Happy Chinese New Year! For those of you who don’t follow me on twitter, instagram or facebook, for the last few days I have been pottering about in the kitchen preparing for our Chinese feast! If you too want to celebrate but think it’s too late, think again! Chinese new year (also known as the spring festival) is a 15 day festival so grab the shopping list below and get cooking! You’ve got a fortnight to eat as much fabulous Chinese food as you can and I’ve got plenty of recipes for you. Starting with Spring Rolls and Prawn Won tons. A traditional New Year dinner is made up of mainly seafood and dumplings so I decided to make my own Spring Rolls and Prawn Won tons. Prawns are a delicacy and a symbol for liveliness and happiness which I thought was exactly what my housemate and I needed in the middle of exam hell! Dried oysters are also often eaten as they symbolise all that is good and Fai-hai or Angel hair is eaten as it symbolises prosperity. I also made egg fried rice (egg symbolises fertility watch out Jon) and sesame chicken with green beans as well as crispy spring rolls! But back to Chinese New Year, the recipes will come shortly I promise! You will notice my post is not in the normal colour scheme. That’s because in China red stands for luck, fortune, prosperity and longevity and is often worn at new year! Other traditions surrounding Chinese New Year include giving red envelopes full of money to young couples and children! (Better than the drunken new years kiss you get off of your hairy auntie here in the UK! To any of my aunties reading this, no you’re not the hairy one! 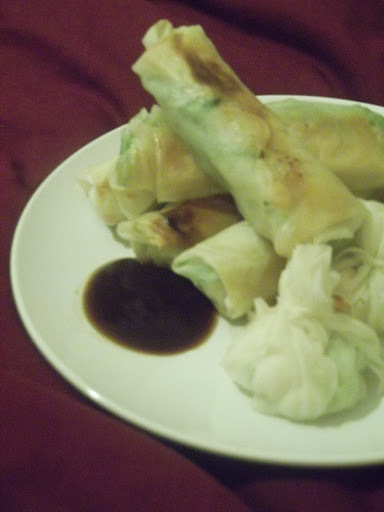 So to take that horrible thought off of your mind, here are the recipes for my Spring Rolls and Prawn Won tons. Spring Rolls and Prawn Won tons. Begin by stir frying the bean sprouts in a little oil with the soy sauce for a few minutes. Place these to one side and allow them to cool. While the bean sprouts are cooling chop the other vegetables into thin matchsticks. Place the spring roll wrapper in front of you in a diamond shape. Place a small amount of the filling in the middle so that the matchsticks lay from left to right. Fold in the two sides and then, like an envelope, bring the bottom of the wrapper up as high as you can go, then pull the top flap down an wrap tightly. Wetting the last point of the spring roll wrapper will help it to seal. Once they are all wrapped up, heat a little oil in your wok. Cook on a medium to high heat for 5 minutes or until golden brown all over. Dice your prawns and spring onions finely – so fine they are almost minced. Crush your garlic and grate your ginger before adding this to the prawn and onion mix. Take your round won ton wrappers and place a teaspoon of the mixture in the middle. Wet the edge of the won ton wrapper and pinch part of the won ton wrapper together to for your first pleat and gather the won ton wrapper around in a circle so that it is twisted at the top and the filling completely hidden. 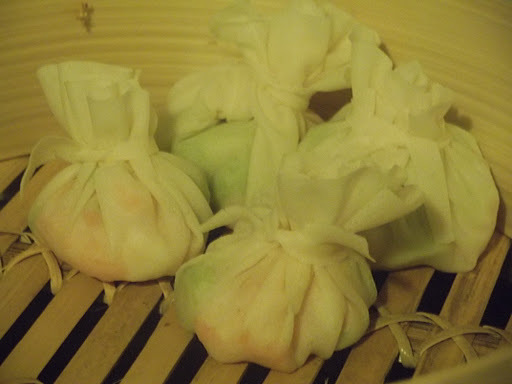 Place each little won ton into the bamboo steamer and place over a pot of boiling water. Cook for ten minutes or until the filling is piping hot. Next I will show you how to make Sesame Chicken with Green Beans and Egg Fried Rice!